Saving chairs and ladies in distress. worked her magic, and i just picked up everything ready to put back together. I have spent today stripping the arms and legs and will be refinishing them this weekend. The Vibe Sunkissed fabric is real nice! 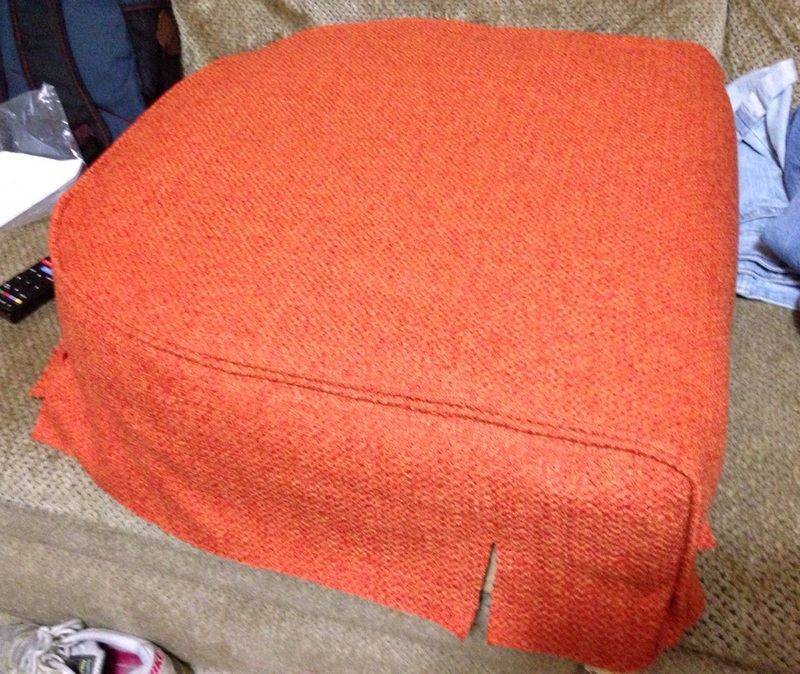 A preview of the seat fitted with the new fabric! 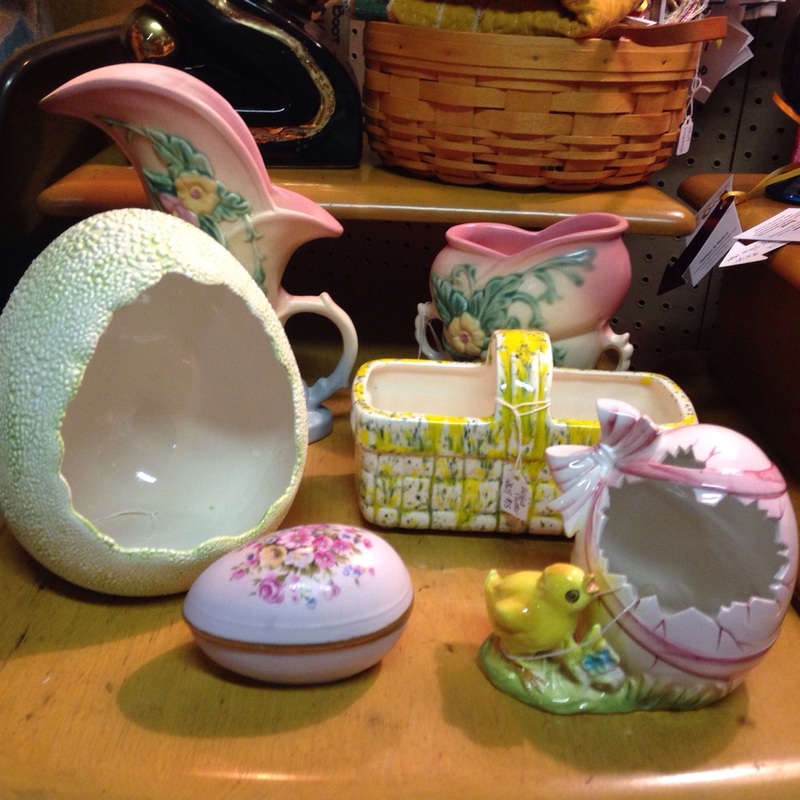 i picked up some vintage easter items this week and they are all in my booth space at fleetwoodantiquemall.com so pop over if you are local and have a look. I also added a complete set of Pyrex Sunflower aka Daisy cinderella nesting bowls. Easter goodies and Hull Art Pottery I just added. I pride myself on curating the best selection of pyrex in the mall! I try to keep my prices competitive with the market and save you shipping. 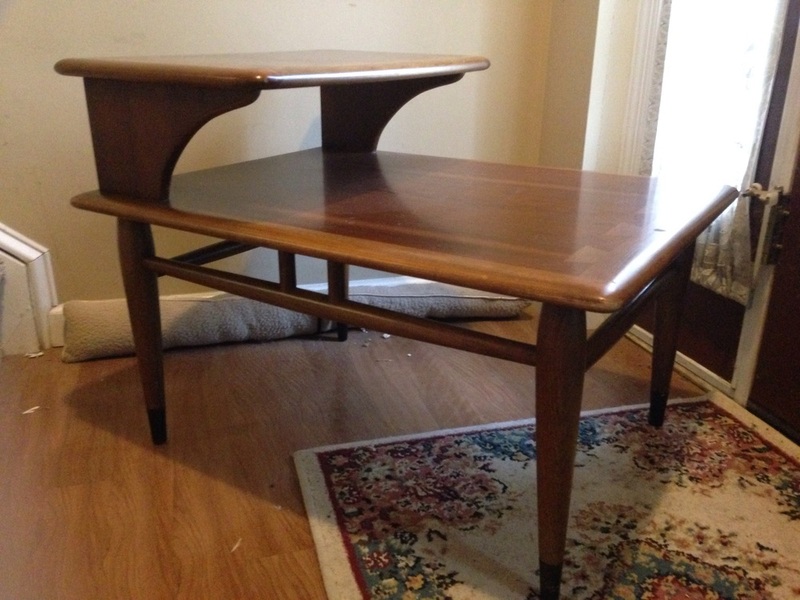 I just added a single Lane Acclaim Step End table to my inventory and it is beautiful! Great condition with no significant issues! Check it out in the etsy store! Highly popular Lane Acclaim line features walnut veneer with inlay dovetail design. This is a nice lower profile end table. Common enough to add pieces easily, it is a nice collectable line. My most exciting fun of the week was meeting up at an estate buy out to pick up a cosco stool and some lights which need to be cleaned up. The house was on the other side of our county and nestled in a little gorge in the woods. A small steam ran through next to the house and under the shed in that we crossed a little bridge from where we parked. Sadly, the homeowner died 3 years ago and only now was the place being cleaned out. All utilities had been off and the moisture was just rotting the floors. Shame. I threw some items in my pile to buy and discovered this lovely little lady that I just had to have. When I got her home, I cleaned off the filth and found a signature! B Mankowski. I dug a little and found out the artist, Bruno Mankowski, died in 1990. He was known for sculpting bronze medals but also worked for FDR's WPA to rework a degraded mural in the Capital building which he did in granite. He was published and mentioned in various publications. I also discovered that all of his records and catalogs are available for viewing with a reservation at an art history museum in Washington DC, and I do plan on taking a trip there this summer to research. A few past auction info revealed that there are indeed more than one sculpture like mine, but my friend who has a father that is a sculptor told me they will cast more than one. She will look it over for me next week to see if we can figure out what it is made of. She is pretty heavy! This will be an ongoing research project and although I do not intend on selling her, I would like to document her in the event that I would need to in the future. An appraisal attached to one of the auction pieces proclaimed value at $3000. Either way, you can count on me to uncover lesser known artists and designers and preserve their history and legacy! I am excited to learn more of this German-American artist!